Deceased’s family was denied ration between October and December. She did not get her pension for November and December. Right to Food Campaign, Jharkhand, a civil society organisation, has claimed that Aadhaar disruption has caused another hunger death. 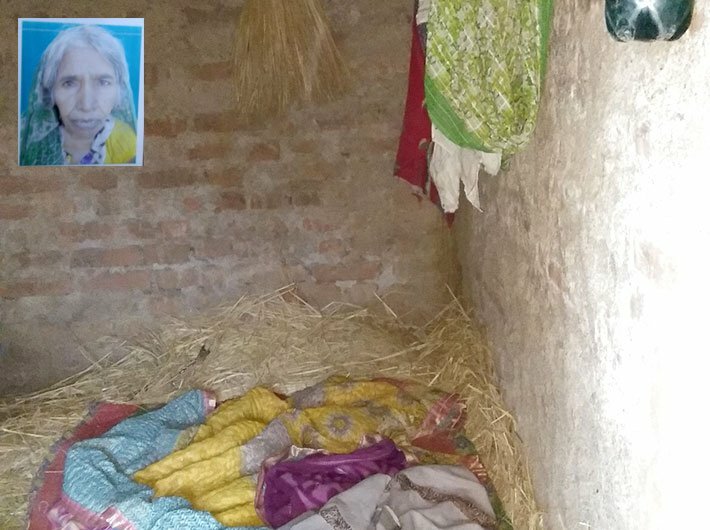 Etwariya Devi, a 67-year-old widow, died of hunger and exhaustion on December 25 in Sonpurwa village of Majhiaon block of Garhwa district in Jharkhand, said a report from Right to Food Campaign, Jharkhand. Apparently, the deceased lived with her son Ghura Vishwakarma, daughter-in-law Usha Devi and their three children in a dilapidated house. "The family has a hand-to-mouth existence and is routinely unable to access adequate nutrition. Surviving the day on only a meal of rice and salt is not uncommon for it," the report said. The shortage of food worsened for Etwariya Devi when the family was denied ration from October to December 2017 and she did not get her pension for the months of November and December. "Etwariya’s family was denied their monthly entitlement of 25 kg of grain under the National Food Security Act, 2013, for three months preceding her death. In October, Usha Devi’s fingerprint could not be authenticated in the Aadhaar-based biometric Point of Sale (PoS) machine at the local ration shop and she was told by the ration dealer to come back some other day. When she went back after a few days, she was told that the ration stock had finished. The dealer did not give her ration in November as he claimed that he was not allotted grains for that month. No grain was distributed at the ration shop in December till Etwariya Devi’s death as the PoS machine was allegedly dysfunctional," said Siraj Dutta and Mithilesh Kumar, the two researchers associated with the Right to Food Campaign who visited the village. A general complaint of people of the village is that the dealer does not distribute ration as per the transactions made in the PoS machine, the researchers said. In October, for most ration card holders, the dealer transacted twice the monthly entitlement of grain and kerosene quantities, but distributed for only a month. The report said that denial of ration to Etwariya’s family is yet another example of the disruptions in the Public Distribution System (PDS) caused due to its mandatory integration with Aadhaar. "Dealers have started tampering with digital records in order to hide accumulated stocks. One way they do this is to separate authentication and distribution – get people’s fingerprints and/or tell them that they would get rations later, and then play hide-and-seek," added the report. As per the online records, ration was allotted to the dealer for October-December. But the dealer did not distribute ration to many cardholders claiming that he did not have adequate ration stock. These irregularities show that the introduction of Aadhaar-based biometric authentication has failed to curb leakages in the PDS. In fact, it has created new barriers to the access of rations, the report said. Etwariya Devi used to receive her monthly old age pension of Rs. 600 a month in her Aadhaar-linked bank account at the local Community Service Provider (CSP) centre (under Jharkhand Grameen Bank). She last collected her pension in October 2017. In November, no pension amount was credited in her account. When she went to withdraw her pension for December, after authenticating her fingerprint in the PoS machine, the CSP operator told her that the authentication had failed. But as per the bank statement of Etwariya’s account, a transaction of Rs. 600 was made on that day (8 December). In the CSP model of banking, the money is electronically transferred from customer’s account to that of the CSP operator once the customer authenticates the Aadhaar-based transaction. Once the money is credited to the CSP’s account, the payment is made to the customer. The CSP operator of Sonpurwa claims that the internet connectivity was disrupted just after Etwariya Devi authenticated her fingerprint, because of which her pension amount was not credited to the CSP account. Etwariya Devi’s death due to starvation follows on the heels of another death due to prolonged hunger and exhaustion in the district. It may be recalled that 64-year-old Premani Kunwar succumbed to starvation after she was denied her ration and pension due to linkage of these programmes with Aadhaar. "The Jharkhand Right to Food Campaign reiterates its following demands: (1) Immediate dismissal of the ration dealer of Sonpurwa and registering FIR against him for embezzlement of PDS grain and tampering of PDS records; (2) Immediate shift to “offline” delivery of PDS entitlements; (3) Transfer of all ration shop licenses from private dealers to Gram Panchayats or self-help groups; and (4) Introduction of pulses and edible oil in the PDS," the report said.